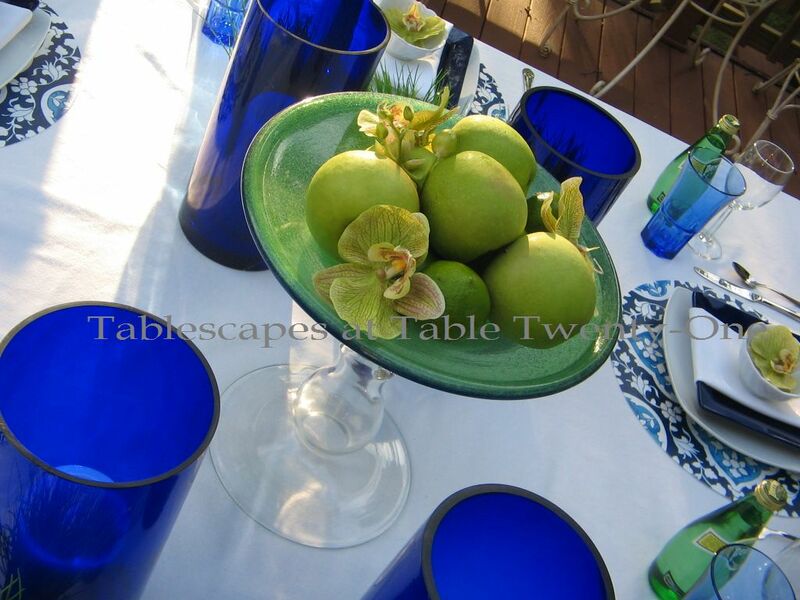 There is really nothing quite like the cooling, soothing look of cobalt blue in a summer tablescape! Mixed here with grassy greens and cloud-like white, it takes on a casually sophisticated look that is one with nature. For each place setting, I started with a crisp, white cotton linen. 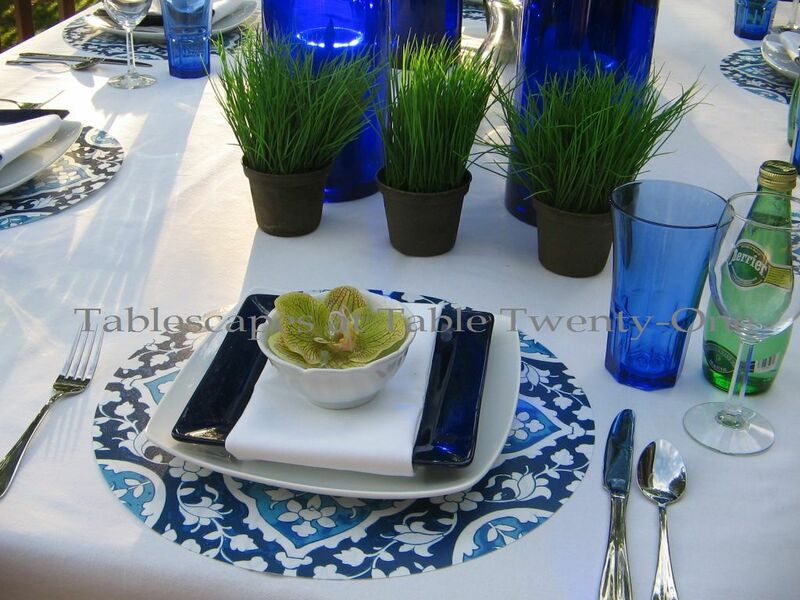 The beautiful blue & white placemats are a vinyl reversible from Bed, Bath & Beyond that caught my eye. 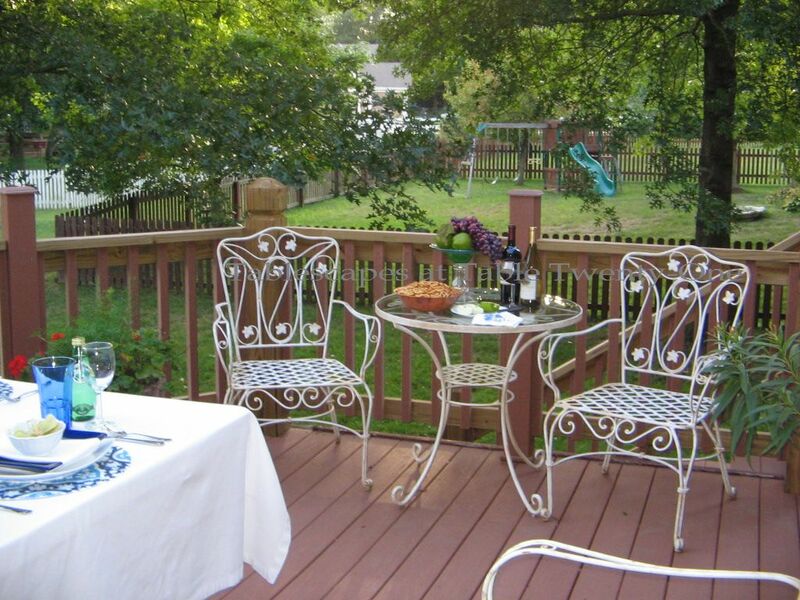 The stark white square dinner plates, also from BB&B, are from the B. Smith With Style collection. 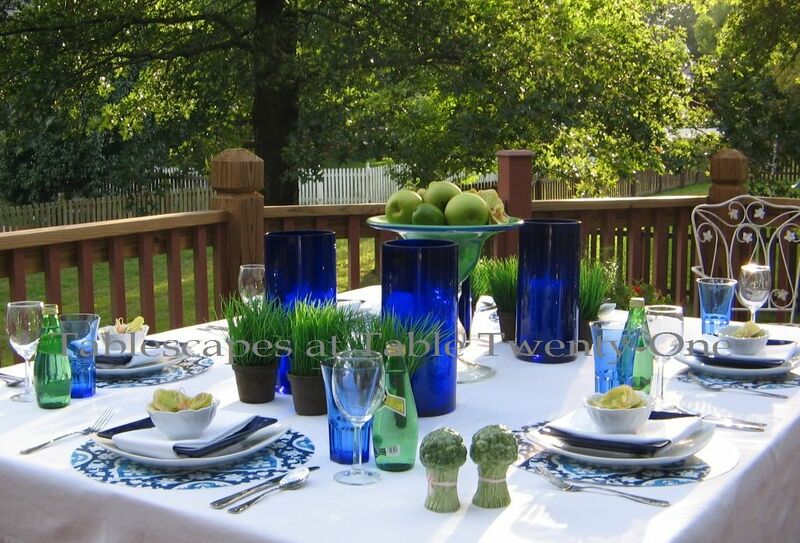 The deep blue salad plates and graceful finger bowls are from Pier 1 Imports. I like these bowls because they can be used in so many ways! I’m sure you’ll be seeing a lot of them in subsequent tablescapes. 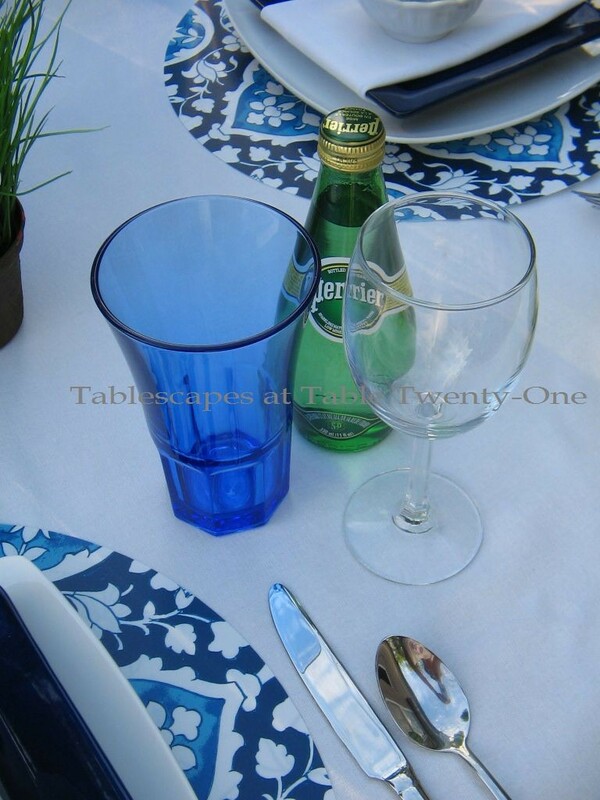 Simple Pfaltzgraff “Legacy” flatware and cobalt blue glass tumblers from Old Time Pottery finish the look. 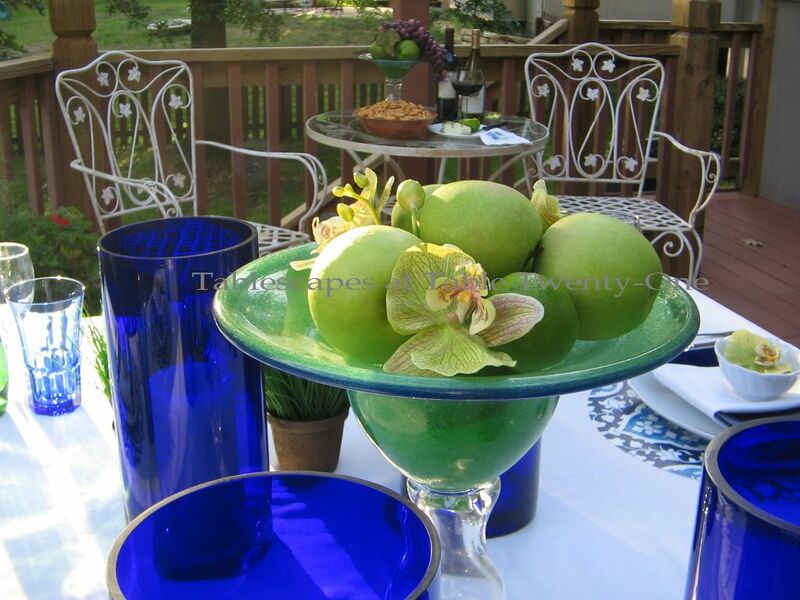 I picked up this gorgeous green & blue glass compote several years ago, and I am always thrilled to get a chance to use it in a tablescape! Filled here with an abundance of juicy Granny Smith apples, succulent limes, and cymbidium orchids, it really stands out. Orchids are so pricey that I often can only afford a single stem or two. Plucking the blooms and floating them in water (or tucking the stem into a water tube as in the centerpiece) is a wonderful option with a lot of impact. The flames of white candles in the cobalt hurricanes dance when the sun goes down. 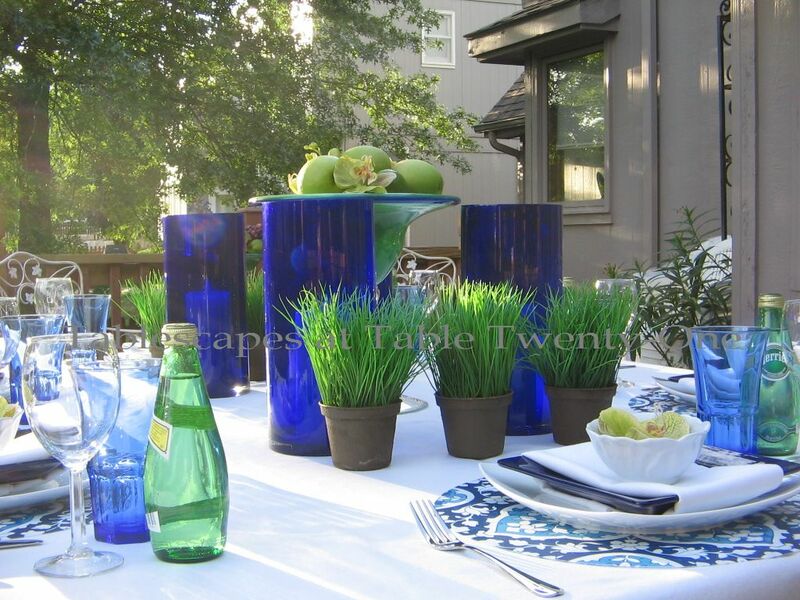 The potted grass is just another way to pull in the color green and to add texture and interest to the overall centerpiece. Another way to punctuate the tablescape’s look with a bit more green was to place individual bottles of refreshing Perrier at each guest’s setting.